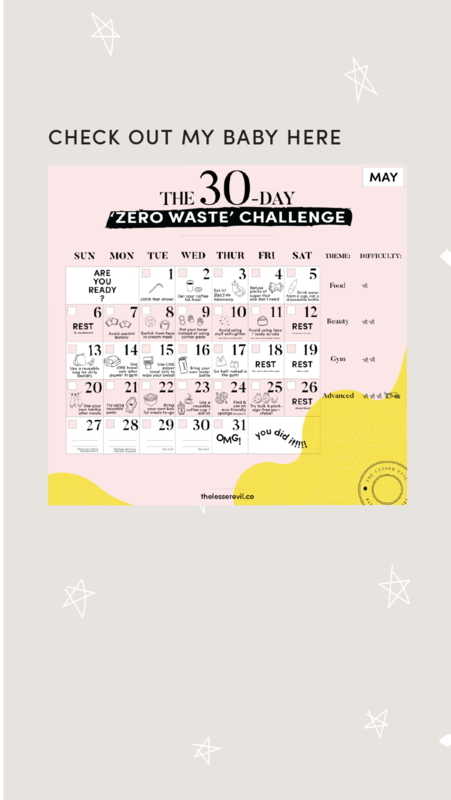 It's May soon and I was playing around and compiling a list of small things we can do each day to reduce waste. The idea here is that living a 'zero waste' lifestyle isn't necessarily what everyone wants, and it certainly doesn't happen overnight. But for those of us who still want to try living more mindfully, or those who are skeptical as to 'can I really do it? ', here's a little fun challenge for you! The first 3 weeks are free, and it's only when you reach the 4th week would you need paying a lil' somethin' somethin'. I hope to make this accessible to everyone, so I try to include as many 'free' little acts as possible! Yes! The last week is empty, so you can fill in some of your inspiration / ideas. :) Don't forget to let me know what you've put in! Click to download the calendar here! Have fun and let me know if you like to see more of this! !